Fire up the Grill. Memorial Day Weekend is here and it’s all about grilling. 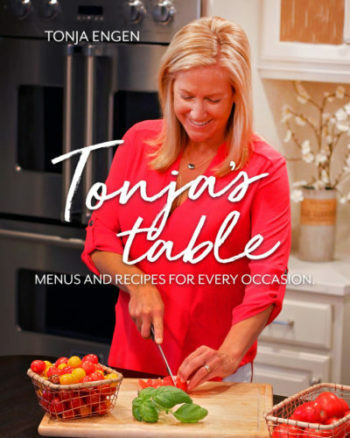 I wanted to deviate from the traditional burgers and brats so I’m sharing with you a favorite grill recipe from my cookbook “Tonja’s Table: Menus and Recipes for Every Occasion.” I seriously LOVE these Tandoori-ish Chicken Kebabs. Yogurt is one the the best tenderizers for meats and when you add fresh ginger, garlic, paprika, cumin, and cayenne to the mix you are in for a flavorful treat. These can be made-ahead and popped on the grill when you are ready to eat. I love serving them with tomatoes, lettuce, and homemade tzatziki sauce on Naan bread. Yay–Minnesota summer is finally here. In a medium bowl, stir together yogurt, lemon juice, oil, ginger, salt, smoked and hot paprika, garlic, black pepper, cumin, and cayenne pepper. Add the chicken to the spices and stir to coat. Cover and refrigerate and marinate 2-4 hours. Thread chicken tightly onto skewers. Brush grate with oil, and place skewers on grill. Grill for 15 to 20 minutes, occasionally turning kabobs to ensure even cooking. Remove Chicken from skewers onto a large platter Add naan to platter and serve. Mix the tzatziki ingredients together and stir well. Cover and refrigerate until ready to use.